On August 3, 2018, UMKC School of Dentistry third and fourth year dental students from the Students Take Action organization and Pediatric Dentistry Club volunteered at a special TeamSmile event. Students from second, third and fourth year dental classes also joined in. 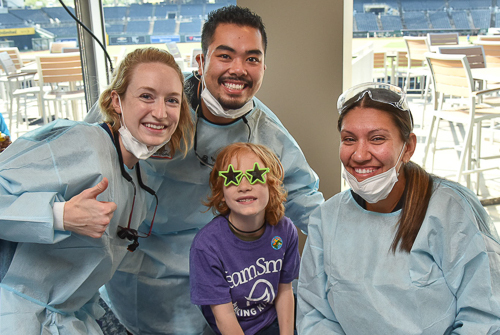 This TeamSmile event was hosted by the Kansas City Royals at Kauffman Stadium. Royals greats John Mayberry and Dennis Leonard were on hand, passing out their baseball cards and greeting the children. Local dentists, students and volunteers provided free dental care for almost 300 children. Dr. Bill Busch was inspired to partner with professional athletic teams to provide free dental care to children after he heard the story of Deamonte Driver started TeamSmile. Find photos from the event here.